Finally an easy way to get back in your raft! 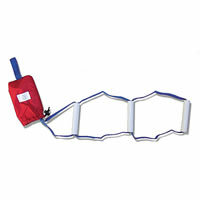 The original Netties Bag Ladder is a small three rung ladder made from webbing and PVC pipe. It attaches to your frame or D-ring with a sewn-in loop and also has its own storage bag to keep it out of the way when not in use. A must if you have kids or when boating alone. From Katie B. of Bozeman, Montana on 2/17/2014 .